http://www.xgarreau.org, this is Zaz website, author, among others, of the ZazouMiniWebServer about which I already talked you about several times. If coucoucircus.org looks like it is today, this is thanks to him. If the database works properly, this is thanks to him. If you can define a play list, this is also thanks to him... What do you mean by "what am I here for"?! Les Grands Z'Enfants is an association of toy collectors, all topics and periods combined (vintage video games, Japanese robots, lego, playmobil, star wars, various licenses ...). They also organize the toy fair of Razac-sur-l'Isle. "A la croisée des jouets". - Promote the 80's : Development partnerships with other websites, participation in exhibitions related Eighties, production of leaflets, stickers, posters, press kits, t-shirts and other communication tools. 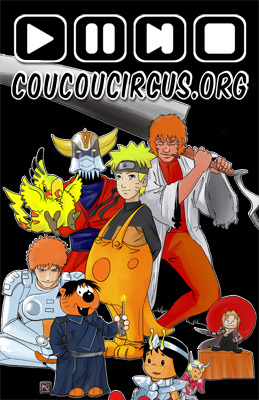 With OccazOtaku go free ads for all your manga, your models, your cosplay, video games or other products manga. You can view all ads free personal and professional. Génération Souvenirs is a websitesite selling online objects of the 70, 80 and 90. The first e-commerce site on themes as diverse as television, music, toys, books, products, fashion and accessories, party items and even times of candy! Anime guide You will find here a great encyclopaedia of animation series, with more than 600 Guides of series containing each time the episodes' titles, pictures and plenty of information! Animeka.com is not complicated. You are looking for a cartoon, you go there, and they are all listed: Information, synopsis, picture, and net surfers' opinion. You then know right away if the selected cartoon is worth watching at. And if it really is, you know which company own the licence. La page des génériques. You are looking for lyrics? Information about the openings? This is where you have to go. High inspiration to coucoucircus.org, I thank the Opening's page to have put its database at everyone's disposal. Musiques.uru.org. A very complete Website regarding cartoon's openings, giving links towards lyrics, towards videos, and some CD references to make your own real compilation! The Animez-vous association is represented by a very complete Website connected with japanimation. By default, you can access to the lyrics and to information related to lots of cartoons. Being a member of the association allows you to access to the Openings and pictures. The Flashback shop offers collection toys from sixties to today on the subject of TV series, cartoons, comic books and movies. We specialize in vintage toys in their original packaging..
Tokyo Café, is an open place for manga fan. Sit down in a comfortable sofa and choose one of the 4000 avaliable books. Drink is free. Open 7d/7 from 10 AM to 10 PM. Entry from 3€. The address : 56, bd d'Arcole - Toulouse - France. Annuseries.com. Everything is in the title: A TV series' encyclopaedia with plenty of information. Anime Lyrics. You are looking for the lyrics of your preferate animations in Japanese or English: Animelyrics.com is the essential address. From .hack//SIGN to Zone of the Enders, almost all the transcriptions of the openings and endings. In addition, a J-Pop area, a Game Lyrics area, and a Dancemania Lyrics area. In short: a very complete website. Karad'oc is a karaoke box project, according to the Japanese concept, being created in Toulouse. Private rooms with large screen, touch pad as a remote control and room service will be at your disposal! Large selection of French, international and asian songs, and the best of Japanese and French cartoon songs. Find information on this project and its development on our blog.